The Resilient Farm and Homestead is a manual for developing durable, beautiful, and highly functional human habitat systems fit to handle an age of rapid transition. Ben Falk is a land designer and site developer whose permaculture-research farm has drawn national attention. The site is a terraced paradise on a hillside in Vermont that would otherwise be overlooked by conventional farmers as unworthy farmland. Falk’s wide array of fruit trees, rice paddies (relatively unheard of in the Northeast), ducks, nuts, and earth-inspired buildings is a hopeful image for the future of regenerative agriculture and modern homesteading. The book covers nearly every strategy Falk and his team have been testing at the Whole Systems Research Farm over the past decade, as well as experiments from other sites Falk has designed through his off-farm consulting business. The book includes detailed information on earthworks; gravity-fed water systems; species composition; the site-design process; site management; fuelwood hedge production and processing; human health and nutrient-dense production strategies; rapid topsoil formation and remineralization; agroforestry/silvopasture/grazing; ecosystem services, especially regarding flood mitigation; fertility management; human labor and social-systems aspects; tools/equipment/appropriate technology; and much more, complete with gorgeous photography and detailed design drawings. 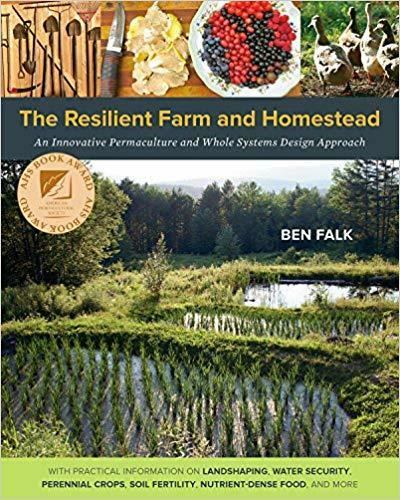 The Resilient Farm and Homestead is more than just a book of tricks and techniques for regenerative site development, but offers actual working results in living within complex farm-ecosystems based on research from the “great thinkers” in permaculture, and presents a viable home-scale model for an intentional food-producing ecosystem in cold climates, and beyond. Inspiring to would-be homesteaders everywhere, but especially for those who find themselves with “unlikely” farming land, Falk is an inspiration in what can be done by imitating natural systems, and making the most of what we have by re-imagining what’s possible. A gorgeous case study for the homestead of the future.